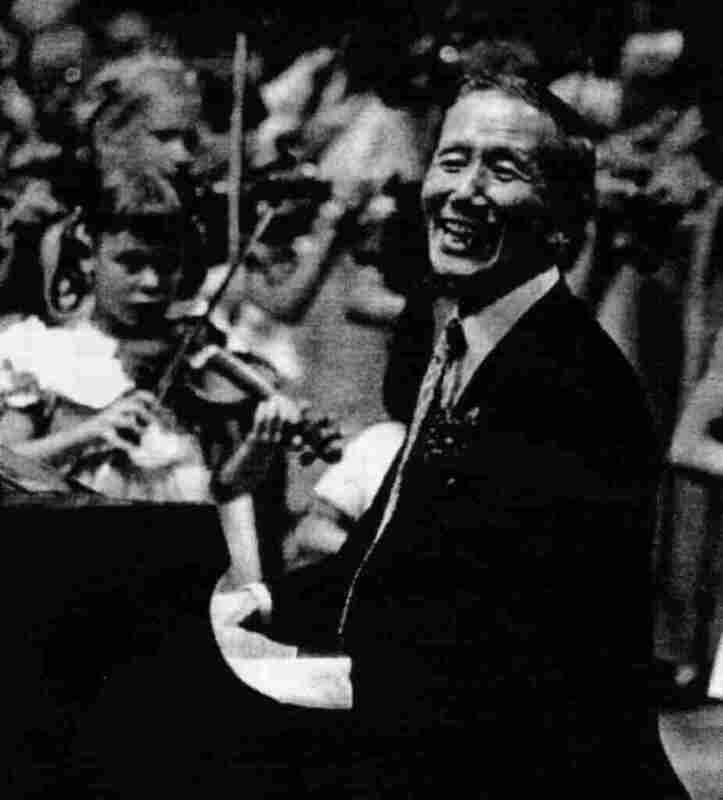 Dr. Shinichi Suzuki, the founder of the Suzuki Method, died in Matsumoto on January 26 at the age of ninety-nine. A funeral mass was held on January 28. The City ot Matsumoto will conduct a public memorial celebration for Dr. Suzuki on Tuesday, March 17 at the Kenmin Bunka Hall. On February 8, the day after the opening ceremony of the Olympics, the "Olympic Memorial Concert of the Suzuki Method" was held in Nagano City. Among the pieces on that program were four works performed on ten pianos: Gigue - Bach, Turkish March - Mozart, Ritual Fire Dance - de Falla, and Hungarian Rhapsody #2 - Liszt. Dr. Kataoka writes: "Dr. Suzuki is the person who did the most excellent thing among educators in the twentieth century." May he rest in peace, knowing that his life has touched hundreds of thousands of the world's children and will continue to touch them, as long as so many dedicated teachers are committed to keeping his method alive. (Photo courtesy of Art Montzka). those days, Dr. Suzuki, although his hearing was fading and his memory was not always clear, at age 89-92, was a daily presence at the kaikan. As far as I could tell, he never missed a day the entire time I was there. Every morning he would arrive, always dressed up, for his group lesson with the violin teachers at 9:00 a.m. We pianists were furiously practicing at that time, before the piano studios got busy with teachers and children. Every day, at the conclusion of the violin class, Dr. Suzuki would go into his office and reappear with an armload of cookies and other treats for all of us kenkyusei. There were cookies and tea or coffee like this every morning at around 10:30. We pianists would take a few minutes to join in for our snacks. Dr. Suzuki would often go around the room and personally offer cookies to each one of us. He took great joy in being the cookie man. There were even occasions when, especially before our graduation recitals, we felt we could not take the time to come out of the practice room to have cookies. On those days it was not uncommon for Dr. Suzuki to bring a box of goodies to us as we practiced. He would march right into the room and say, "Please, eat!" For those of us staying long-term in Japan, these treats were very special, as most of us could not have afforded the luxury of sweets and coffee every day. Not only did we have the ordinary packaged cookies, crackers and chips purchased at the grocery store, but often we were the recipients of the elegant gifts Dr. Suzuki frequently received in the form of very expensive Japanese confections or special boxes of chocolate from Europe: things we never would have enjoyed otherwise. "HIS JOY IN GIVING THEM SEEMED B0UNDLESS"
I was recently reading Dr. Kataoka's reflections on the hardships Japanese people experienced after the war. There was never enough food. People had no clothing, no homes, no heat. Dr. Suzuki lived through that experience, and I often think that this was why he took such joy in feeding his students special treats. Our appreciation of them was limited by our own comfortable backgrounds and the minor inconvenience of being unable to afford them on a daily basis. His joy in giving them seemed boundless. My sister and her 1-year-old son, Orion, came to Matsumoto for my graduation recital. They had met Dr. Suzuki. So when he died, I told her by e-mail. I got a reply back saying, 'I remember he gave Orion a cookie." Tone has a living soul. not only in music but in all things. If love is deep much can be accomplished. The staff at Piano Basics Foundation joins with Cleo in this expression of appreciation and remembrance. The piano is an instrument which produces sound no matter who touches it. It does not even have to be a human being, for even if you drop an object on the piano keys, or if a cat walks on them, sound is produced. Those who play other instruments such as strings or winds, and also singers, are therefore heard to say that it is easy to play the piano because tone is easy to produce, while they must go through various procedures and expend deliberate effort to produce sound. They must also be responsible for the intonation of each sound they make. So they therefore conclude that piano must be easy compared with their instruments. This is a great mistake, and is the source of much trouble. Because most people in this world are not professional musicians, they think that any sound on the piano is a musical sound. They really believe that any sound produced on a very fine piano is music. It cannot be helped if lay people think this way, but anyone who is called a piano teacher who neglects the important study of "what is musical tone" is taking advantage of people's ignorance on the subject. Teachers must teach musical tone, not just any sound. When students come to lessons, the most important thing the teacher must teach is good tone. Of course, there are details about the individual pieces that must also be taught, but the most important things, before everything else, are musical basics and musical tone. Because tone and melody must be filled with one's heart and soul, this is what is most important in music. Bad tone (noise) is produced when the keys are hit with stiff fingers, when a "crash" occurs between the finger and the key. Our first impression of such a sound is that it is loud and unpleasant. Of course, loud noise is very disagreeable. [Most people can hear this.] It is not so easy for people to hear small noise [bad tone that is quiet]. This is the kind of light tone that is made by only touching the piano key. It is the same as loud and boisterous noise in that time and rhythm cannot be kept. Many people in this world only memorize pieces and play them with this light tone and with hitting, crashing and other terrible tone. They erroneously equate this with musical performance. Why is it that so many pianists and piano teachers play with such terrible tone? It is because their colleagues, even at music schools, all play with hard and terrible tone. Human beings are always controlled by a majority. A young pianist honestly told me, when I asked why he played with such a terrible tone, that he thought it was better because everyone played like that. The great, first-class pianists in the world, Radu Lupu, Minoru Nojima and Maurizio Pollini, whom I heard recently, and the great masters such as Rubinstein, Gieseking, Horowitz, Gould, etc., whom I hear on recordings, all play with a musical tone with all their heart and soul. We are all human beings who have a heart and a soul which are given to us at birth by God. It is a pity if we acquire the habit of playing with poor tone and making noise, and thereby do not make the most of our special gifts. If you only have a little time to practice and do not finish a piece, it is all right. Or if learning is very slow, such a thing does not matter at all. Being able to play the piano using a heartfelt, true, natural and musical tone becomes a great joy throughout your entire life. The piano is avery difficult instrument when we think about the matter of tone and how to teach it. I want both teachers and trainees carefully to reconsider, to listen to good tone with concentration, to study so that you know the difference between good and bad tone. This and other articles by Dr. Kataoka in this issue are translated by Mitsuo Furumachi and edited by Dr. Karen Hagberg. BY DR. HARUKO KATAOKA This piece is allegretto and in 2/4 time, C major. Considering just these things, we can understand that this is a light and enjoyable piece. We must practice the left hand in measures 1-4 correctly. Because the piece is in duple time, the first beat is played down, and the second beat is up. This "down and up" feeling is the same as human breathing. Therefore, there is a half note on the first beat in each measure. Despite the fact that an accompaniment is always played softly, play this half note deep and long with a downstroke. Be sure to play the C in measure 1, the D in measure 2, the B in measure 3 and the C in measure 4 so that they are connected to each other, legato. The remaining three chords in each measure must be played very lightly, softly and quietly and all the same length. Be careful not to lengthen the third chord in each group. We should play the first note, an upbeat, in the right hand with the third finger as we "inhale." Then we must sing out the following dotted note E, which is sung with a deep, heartfelt feeling. The C at the end of measure 1 going to the dotted B in measure 2 is the same pattern: a light, inhaled pickup note going to a singing downbeat. This pattern repeats itself through measure 4. In measures 5-8 we sing out the chords in the right hand with a loud voice. The short notes in measure 7 are played lightly after these big chords, and the two notes ending the phrase in measure 8 should be played beautifully and decrescendo. This piece is most difficult for the left hand, so we must practice this especially much. The difficulty is not so much in the order of the notes, but in keeping the balance. Practice the left-hand 16th notes in rhythms by playing the first of each group of four with a long, deep tone, followed by three short, light notes. Doing this practice not only helps the student to execute this piece well, but it also teaches left-hand balance. Teachers, please be sure to teach the student how to do this practice week after week. The right hand from the end of measure 16 through measure 17 may be practiced in the same way to produce good legato. Play the two chords in measure 18 very lightly. Enjoy the harmony in measure 20, playing a musical tone by moving the fingertips with a soft hand. After this measure, the same music repeats itself to the end of the piece. This composition is fun and beautiful. Please enjoy it. We are honored to have Dr. Haruko Kataoka returning as master teacher for the institute this summer. In addition to teaching the Piano Basics Course (teacher training), Dr. Kataoka will also teach a limited number of children's lessons during the week. The student lessons are allotted on a first-come, first-served basis. There are two options for teachers at the institute. You may register as a participant, which includes a lesson with Dr. Kataoka in addition to full observation privileges at the institute. Participants may also register this teacher training with the SAA. If you do not wish a lesson, you may register as an auditor, which includes the full observation privileges (including teacher training sessions). Adults who register as observers may observe all institute activities EXCEPT teacher training sessions. All student institute participants receive three to five hours of daily classes. Daily piano lessons are taught by Bruce Anderson (St. Petersburg Beach, FL), Gretchen Smith (Greenville, NC), Kagari Tanabe (Bellingham, WA), and Linda Nakagawa (Sacramento, CA). Each student also has a daily theory class. The remaining classes are arranged according to the age and advancement of the students. They include creative movement, Musikgarten, improvisation and juggling classes. In addition to the daily student recitals, all students will be featured on the final recital, Friday, June 13. Special recreational events during the week include a picnic/swim party and a banquet honoring Dr. Kataoka. Housing is available in Louisville Hall, a dorm located about two blocks from the School ot Music. There are some nearby bed-and-breakfast establishments in addition to several hotels within a couple of miles of the university. The Louisville area is rich in recreational activities: The Louisville Zoo Kentucky Kingdom The Belle of Louisville (steamboat on the Ohio River) Louisville Science Museum Louisville Slugger Museum Kentucky Derby Museum at Churchill Down. Bemheim Forest (hiking/nature preserve) My Old Kentucky Home and The Stephen Foster Story are located nearby. Brochures will be mailed to all Piano Basics Foundation members by early March. If you need additional brochures or failed to receive one, please contact the institute director. Following the University of Louisville Institute, Dr. Kataoka will teach students for two days in the studio of Bruce Boiney. Lessons will be balanced with students throughout the Suzuki repertoire. Approximately three hours of lessons each day will be devoted to short "workshop style" lessons where students work on one piece of music. The remainder of each day will be comprised of 30-minute lessons where students have a "standard' lesson --scale, lesson piece, and reading. It is unusual to be able to see Dr. Kataoka work in this way here in the United States and it proved to be a very educational format last summer. Teachers are welcome to observe, but space is limited. Please contact Bruce as soon as possible to take advantage of these "bonus" teaching days. This workshop will provide in-depth study of Piano Basics with Dr. Kataoka. The daily schedule consists of master class lessons for teachers and students and daily lecture time with Dr. Kataoka. Lessons with Dr. Kataoka will be available for all teacher participants and students who perform in the Friendship Concert. This is a Five- Day SAA-approved Teacher Training Institute. Wednesday. Teachers enrolled in the workshop are invited to submit videos of their students to be considered. Deadline for videos is May 1,1998. See brochure for application form. The closing event of the week is the Atlanta Area Suzuki Piano Association's Third Graduation Concert. Teachers will have the opportunity to research the Graduation Process by attending the concert, dress rehearsal and a lecture about the AASPA Graduation Program. In addition, a panel from around the country will present their Graduation Programs and share how their Graduation Systems work. Join us in Atlanta at Spivey hall for an enjoyable week of learning. Activities will include Family Day on Tuesday, featuring Dr. Kataoka speaking to Parents and Teachers, a picnic by the lake and the Friendship Concert. On Wednesday evening a Teacher dinner will be held followed by the Graduation Panel discussion. Spivey Hall is an elegant music recital facility with outstanding acoustics, located in a beautiful natural setting next to a lake, just 15 minutes south of downtown Atlanta. · Our Rochester workshop will be held this year at the Woolard Gallery, located in downtown Rochester within walking distance of a large selection of restaurants and museums. · Teachers and guests will stay at a nearby hotel. Some homestay available. · Again this summer several students and teachers from Japan will be in attendance. · A Friendship Concert featuring Japanese and American students will be held on Tuesday, August 11 in Kilbourn Hall at the Eastman School of Music. · Karen and Dorothy will host a dinner for teachers in their home on Wednesday evening. This year's theme: Greek cuisine. · Teachers enrolled full time are invited to bring a student who may audition for the Friendship Concert by videotape. Deadline: June 1 · Social activities will be planned for visiting students with our Japanese guests. BY CORINNA CHANG, REPUBLIC OF SINGAPORE The thought of having to fly 20,000 km alone, over 26 hours--not to mention changing planes four times--just to attend my first Suzuki Piano Basics workshop filled me with apprehension. Would the nine days of observation justify the cost, the time and the effort or would I be disappointed? The workshop turned out to be a most intense and rewarding experience. With two Kawai grand pianos, a video recorder and a master teacher in Dr. Kataoka, Wilmot Hall in the picturesque campus of Nazareth College in Rochester was transformed into a temple of joyous learning. Throughout the workshop, I was humbled by the fact that there was so much to learn. Dr. Kataoka's energy and dedication were most inspiring. I was particularly struck by her constant admonitions to the teachers to be firm with the basics--beauty of tone, preparation and readiness, even the basic hand position and posture. I began to understand her refusal to tolerate sloppiness, for we teachers have to be the BEST models and that our pupils were but a reflection of our teaching. Succumbing to the easier road would not be acceptable, and I admire Dr. Kataoka for her steadfastness and honesty in the quest for perfection. Despite all the hard work, being at Nazareth College and the dorms was really like being in a summer camp. The friendliness and camaraderie shared by the teachers, the wonderful playing from the pupils from the U.S and Japan, the hospitality of Karen Hagberg and her very organized crew and the sheer energy and spirit of the workshop made it a pleasure to be there. I would like to encourage the teachers, especially the "rookies" to take full advantage of the learning opportunity offered by Dr. Kataoka and the warm hospitality of Rochester. Indeed, "with love, much can be accomplished" in our mission to impart in our students the ability to play with beautiful tone, spirit and ease. We are pleased to announce that the workshop will be held in the Sacramento Convention Center in downtown Sacramento. Numerous homestay opportunities are also available for teachers. Being the capital city of California, downtown Sacramento has many restaurants and interesting shops, most within easy walking distance of the workshop location. Of special interest to teachers during after-workshop hours are Old Town Sacramento, The California State Fair and Mall Shopping. WHY GO TO A SUMMER WORKSHOP? 1. The basics REALLY are basics! Almost all problems addressed by Dr. Kataoka were helped by returning to the basics, i.e., posture, balance or rhythm, even pieces played by more advanced students. 2. I couldn't clearly hear many of the subtle tonal differences for the first couple of days. The repetitive nature of the teaching at the master lessons helped me absorb a higher concept of sound and what I could expect my students to hear. I have been amazed at the tonal differences they can hear and produce, IF I hear it myself and then truly expect more from them. well with the American students. The modeling was very clear, always illustrating basic concepts. Students were able to effect changes quickly and with understanding. As a relatively new Suzuki Piano Basics teacher, it was reassuring to be with so many teachers, all simply hoping to grow personally in order to help students in the best way possible. I urge everyone to make the effort to participate in a summer workshop and return to their studios with the idea of making some changes. As I teach, a week has not gone by in which I have not recalled a principle, a quote, a sound, or an idea from the Sacramento Workshop. TO RENEW YOUR MEMBERSHIP IN PIANO BASICS FOUNDATION AND TO CONTINUE RECEIVING THE NEWSLETTER WITHOUT INTERRUPTION, SEND YOUR DUES OF $25.00 (CHECKS IN U.S. FUNDS PAYABLE TO PIANO BASICS FOUNDATION TO: PIANO BASICS FOUNDATION, 242 RIVER ACRES DRIVE, SACRAMENTO, CA 95831.